Cab Door Reinforcement. A, AC, ACF, ACO and ACD Models. Where flexing of the cab door upper half is encountered to the extent that proper sealing is not maintained, it is recommended that a reinforcement be installed in the cab door as shown in Fig. l. Fig. 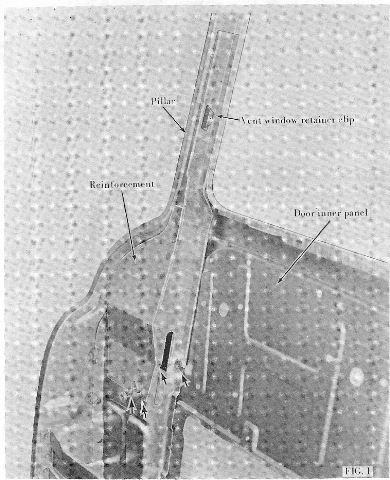 l shows only the inner panel of a left door having a reinforcement installed. The purpose of this is to clearly illustrate the proper position of the reinforcement as it is to be installed in the door. IH Part Number Description No. Req’d. When performing the reinforcement operation, the cab door need not be removed from the cab, however, the door should be checked for alignment and fit while in the closed position. If necessary, straighten the door before installing the new reinforcement. A. Cab Door Glass Removal. B. Cab Door Glass Regulator Removal. C. Cab Door Glass ‘Window Channels and Seals Removal. D. Cab Door Vent Glass Window Removal. E. Cab Door Opening Weather seal Removal. the outer panel. Using a small cold chisel and hammer, remove retainer clip from the pillar. pillar. Approximately l/2" below the mark, drill three l/4" diameter holes through front edge of pillar as shown in Fig. 2. In addition to drilling holes in the pillar, it will be necessary to drill l/4"
sure the distance between the upper and lower retainer clip mounting holes measures 11 inches. Hold reinforcement in this position with three "C“ clamps as shown in Fig. 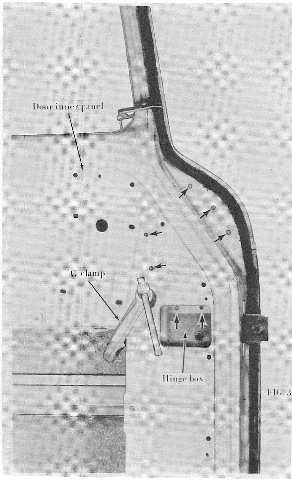 2.
of the reinforcement inside the door as indicated by arrows shown in Fig. 1.
weld surfaces smooth for refinishing. will be necessary to replace the seal. Reassemble the door by referring to Motor Truck Service Manual CTS-2.103 for reassembly and adjustment of door. reinforcement are not available at this time. approximate location of the weld marks indicated by the three arrows shown below the door seal. New IH Parts No. Description Old IH Part No. No Req’d.